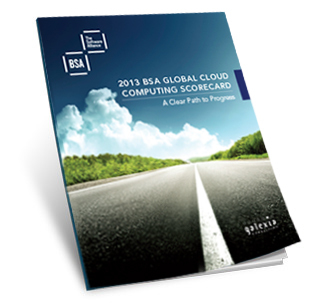 The BSA Global Cloud Scorecard analyzes the legal and regulatory framework and broadband infrastructure of 24 countries that together make up 80 percent of the global ICT market. The analysis is grouped under seven policy categories that are central to the growth and operation of cloud computing. The study includes a detailed country-by-country analysis of legislation, regulations, case law, government policy and standards. The assessments include an evaluation of enforcement and implementation of existing laws in each country, as well as an assessment of compliance with relevant treaties and global agreements where applicable. The Scorecard analysis is based upon a combination of published information and statistics and evaluation by independent experts at Galexia Consulting. Further details regarding sources, including links, are set out in the individual country reports. Each country's score is computed using a 66-item scoring grid and analyses. The scores are derived using a weighted system that allocates different weights to each section/question. A number of basic fact-finding questions are excluded from the scoring system. Each group of questions is weighted to reflect its importance to cloud computing and each individual question is also weighted to reflect its importance within the group. To help with the scoring and usability of the study, the assessments are based on a series of questions that are framed so that a "yes" response reflects a favorable policy setting for global cloud computing. The weights are shown in the table below and the results are available in the downloadable report. BSA | The Software Alliance is the leading advocate for the global software industry before governments and in the international marketplace. It is an association of world-class companies that invest billions of dollars annually to create software solutions that spark the economy and improve modern life.